The Milpitas Grammar School was completed in 1915. It had two offices, at least four classrooms, and an auditorium. It replaced two earlier sructures. The original school of one story and a later built two story Victorian styled wooden schoolhouse, both of which burned down in 1912. In the image below, the buildings face east and the Mission Road because Main Street had not been put though yet. Today's structure faces west and Main Street. Behind the old school was a carriage barn where students and teachers kept their buggies and horses while school was in session. It and a storage building just to the south both burned down with the school in 1912. 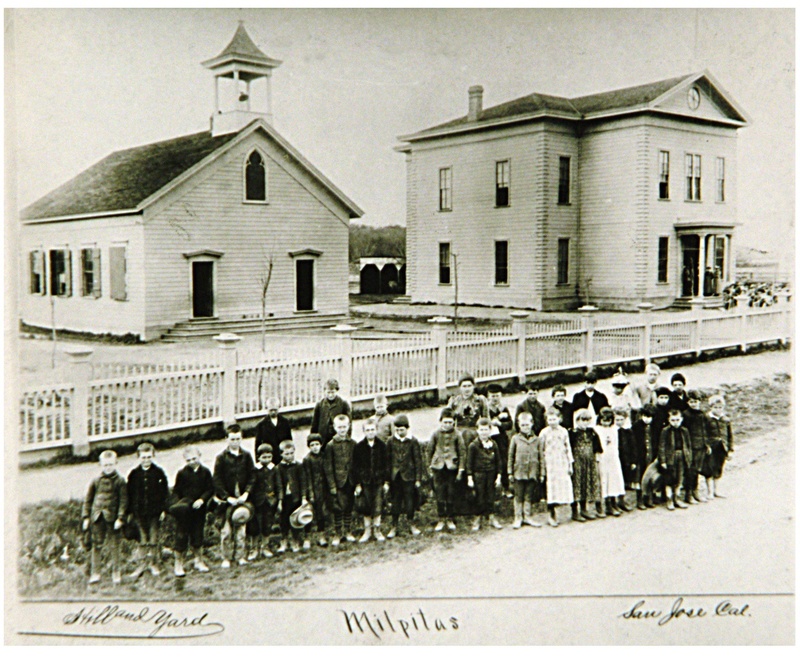 For the three years the new school was under construction, students attended school in a building located on the old Weller Ranch about 200 feet north of the present site. Classes were held in the new building until 1954 when the city was incorporated. For a few years it served as the city hall. It also was the city library for a time. Eventually, it became the Senior Center In 1990, the city undertook a rebuilding/restoration of the school which today, thanks to historical photos of the courtyard and entrance provided by the Historical Society, looks very much as it did in the 1920s (however, the 14 foot high beaded wood ceilings in the four original classrooms are hidden by hanging panel ceilings and flourescent lights). In 1993, the school was listed on the National Register of Historic Places. Picture is from July, 1997. In the early 21st Century the City began construction of the Milpitas Public Library which adaptively reused the old school and added new wings to the north and south of the former school. The magnificent library opened in 2009 and it is a hub of activity.